On July 20 commemoration of St. Elijah the prophet - one of the greatest among the Old Testament righteous, powerful reprover of paganism and herald the true faith in the One God. St. Elijah is celebrated by all Christians as the great biblical prophet with Moses - one of the two greatest men of the Old Testament. The prophet Elijah lived about 900 years before Christ. When he was born, his father pyoluchil vision - impressive men greeted him, swaddled baby diapers fire and flame nurse. Embarrassed, he told that the priests in Jerusalem, and they reassured him by saying, "Fear not, your son will live in light and will judge the people of Israel with fire and sword." This explains the name of the Prophet Elijah, which means Strength of the Lord. St. Elijah is a prophet and a wandering ascetic who lived in the time of Israel's King Ahab, who was a defender of pagan idolatry. Elijah appeared before him, to warn him that God would punish him with deadly drought. The prophecy had come true: drought lasted three and half years. Only then God took pity and sent a prophet to tell the people the end of the disaster. According to the Bible prophet Elijah suffered alive with fiery chariot into heaven before the eyes of his disciple Elisha. This happened in 816 BC. BC. near the Jordan River. In the iconographic tradition most often depicts this particular moment in the life of the saint. 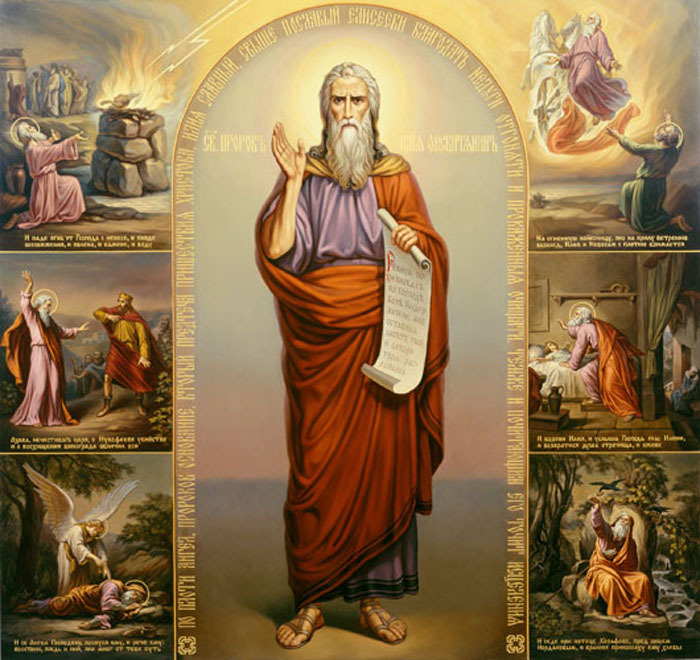 Under the influence of the life of the saint, St. Elijah is accepted and honored as master of celestial elements - lord of thunder, lightning and rain. This power God entrusted in the world was divided between the Saints. According to folk beliefs, when St. Elijah racing in the sky with fiery chariot drawn by four horses are produced thunder and lightning. Legends say also that when the saint rolling barrels in heaven, then the rumble of the earth. So people called it "Gramovnik", "Gramodelets" and "Gramolomnik." The saint had a sister - Fiery Mary St. Mary or St. Helena. According to an ancient belief he fought with winged dragons with Triglav llamas and even with the devil, and from this battle stemmed heavenly elements. If St. Elijah was angry, he poured ice grains from his sleeve or locks rains in celestial cave. In the Bulgarian folk calendar Ilinden is the beloved summer holiday during harvest and threshing. On this day, adults tell stories and sing songs about St. Elijah the prophet, who drives a chariot with six horses in the sky and begs God for their health and well-being, good weather and fertility. His philistine holiday note furriers (tailors), packsaddle, bakers because St. prophet Elijah is their patron. Ilinden farmers in our country make prayers for rain, and in some regions in Bulgaria the day before the holiday is done and the ritual of chasing dragon - a symbol of the land. Traditionally Ilinden in honor of the saint offering sacrifice - the oldest rooster called "father." Housewives baked bread "bogovitsa" and "kolach" to St. Elijah. Organize all-village duties with sacrifice male cloven-hoofed animals - a bull, bull or calf. Kurban is sanctified and tables rank mound consecrated ground near the chapel outside the village, under the old oak trees. It is believed that this will appease the saint will protect the village from hail and flooding. In the image of St. Elijah researchers found remnants of pagan cults of ancient celestial gods - Slavic god Perun, the Thracian Zeus and Proto-Bulgarian Tangra. Name Day celebrate Ilia, Ilian, Iliana, Ilko, Ilka.